Graceful poems juxtapose the mystical with the practical. 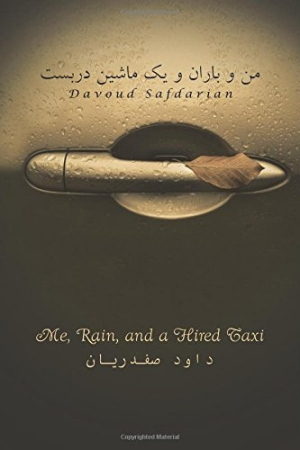 Me, Rain, and a Hired Taxi, a book of poems by Davoud Safdarian, explores the mystical while remaining grounded in the often stark realities of everyday life. Using a consistent form throughout—nearly every poem is exactly four lines—Safdarian crafts beautiful, lingering images that resonate despite the collection’s uneven tone. Calling to mind the work of the poet Rumi, many of Safdarian’s pieces leave one simultaneously satisfied and longing. Complex ideas and images are rendered in poems like “Spring,” which reads: “Spring was lost in an enclosed garden, / but I broke my tracing leg. / You traced it from her lip print, / decorated on blossoms.” The lovely cadence of Safdarian’s language fills a space in the heart—becomes dear—while the poet’s succinctness acknowledges truths about the human experience without moralizing. Similar moments are found in the poem “Sun”: “Nothing is inside except the sun of your love. / How much have I talked about love? I can’t remember. / As much as I drew and drew you on the canvas, / only you are there, not sky.” The brevity of these pieces is in part what makes them so moving; there is little that could be subtracted. But such evocative poems are placed on the page alongside pieces that are much more colloquial and banal. Toward the beginning of the collection, the piece “Galactic”—which reads, “Come! Then stars have to get to sleep. / If they do not realize my galaxy, / my galaxy has two suns. / Let your pupils shine.”—is followed on the same page by “You and I 1,” which begins, “You and I are pals with each other.” Similarly, the aforementioned poems “Spring” and “Sun” immediately precede pieces titled “CD of Love History” and “3-D movie,” respectively. The continual movement between the mystical and the everyday has its place. Within the context of this collection, however, such movement—and the structure it creates—is jarring and off-putting. Poems that render images of war in miniature do serve as a bridge between Safdarian’s two distinct modes. “War 1” and “War 2,” for example, are harrowing in their concision, particularly in striking lines such as, “how we played with flare parachutes” and “War did not hear kids’ voices.” These buffers soften the harshness of the collection’s continuous tonal shifts. The book presents Safdarian’s poems in both Persian and English. An author bio and a brief statement about the content of the collection would enhance the packaging of the volume. Considering the gracefulness of many of his poems, Safdarian would do well to find a trusted editor who could assist with the organization of future books. It is likely that a shorter collection—one that reflects the poet’s own preference for concise form—would be even more resonant.